On October 1, we shared a photo of a building on our Facebook page to see if anyone could guess what it was. Apparently we chose a very recognizable place because there were many guesses and nearly every one was correct! The castle-like structure sits high on the hill at 901 W. High Street and was originally the home of industrialist P.P. 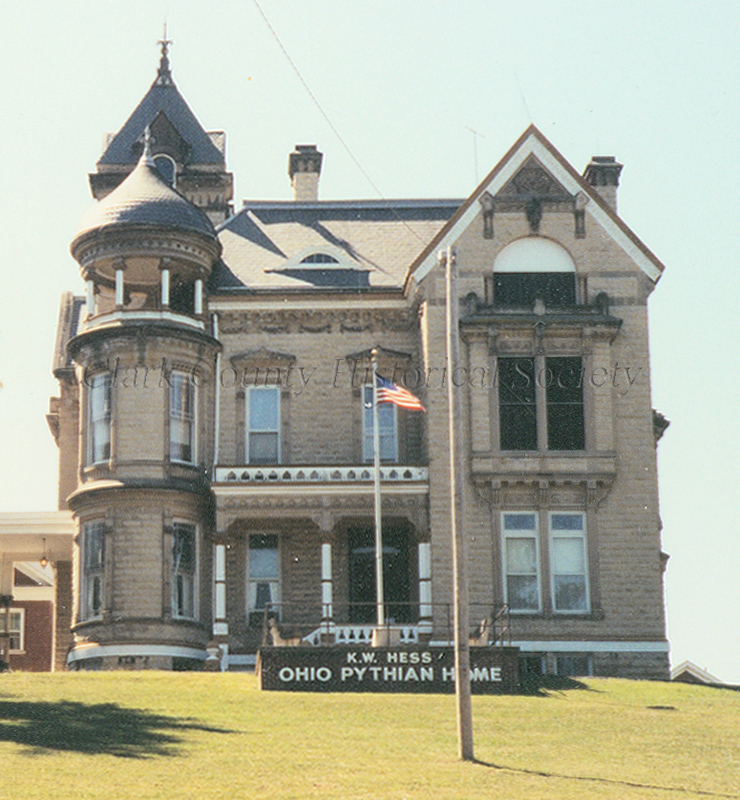 Mast and later became “Castle Knoll,” the Knights of Pythias nursing home. The home was built between 1880-1882 and was modeled after a castle in Italy that P.P. Mast admired during his travels in Europe. He chose the location for his “castle” on the highest knoll in the area, hoping to create a wealthy part of town on the west end. Mast brought over 29 Italian emigrants to work on the amazing woodwork and stonework inside and outside. (He also used local talent, including A.H. Mittendorf, a woodworker who was well known in the Dayton area). The first two floors of the home were the living area while the third floor was a ballroom. The woodwork in each room on the first and second floors was unique and intricate and the stained glass was brought in from France. 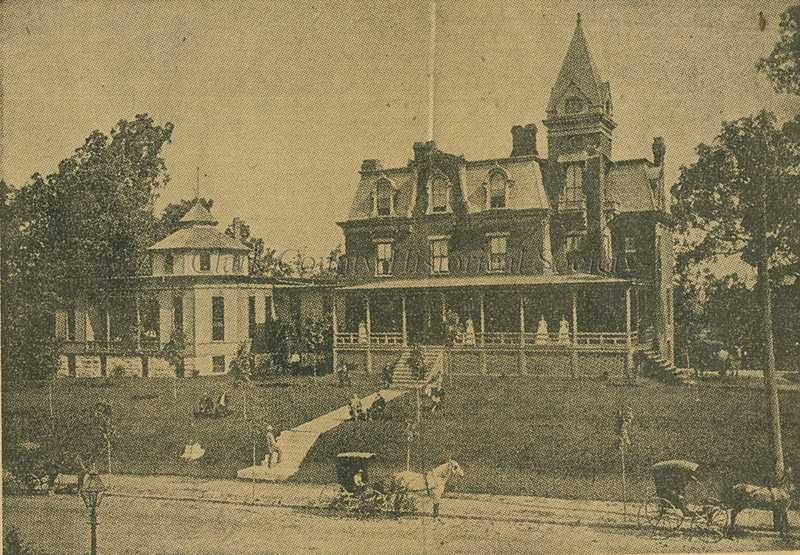 Mast’s earlier home, built 1880-1881 at 910 W. High Street is right across the street and it was reportedly preferred by his wife Anna, who died in April 1895, a few months after a major fire at the “castle” across the street. Mast died in November 1898 and is buried alongside his wife in the Mast mausoleum in Ferncliff. 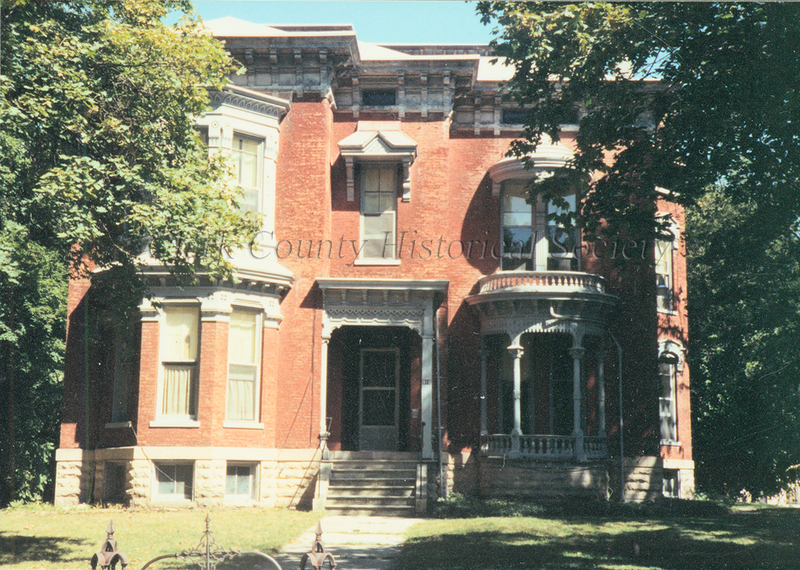 Mast’s home was purchased by the Knights of Pythias and was rededicated as a home for the aged in October 1915. It remained the Pythian’s Castle Knoll nursing home until around 2005 when the home closed and the residents were transferred. 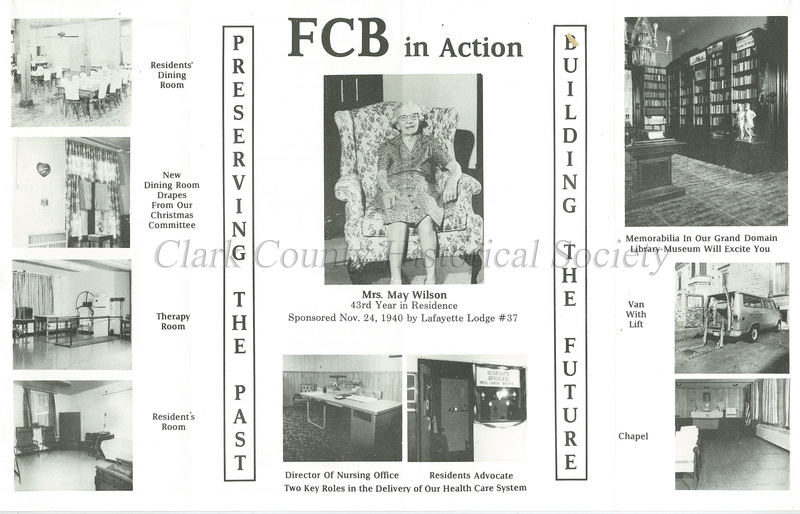 The early records of the home (including the records of the children’s home) until about the 1930s are available in the historical society archives. Phineas P. Mast was born on January 3, 1825 in Lancaster County, Pennsylvania. His family, which included seven siblings, came to Clark County and settled near Urbana in 1830. He attended Ohio Wesleyan and graduated in 1849. 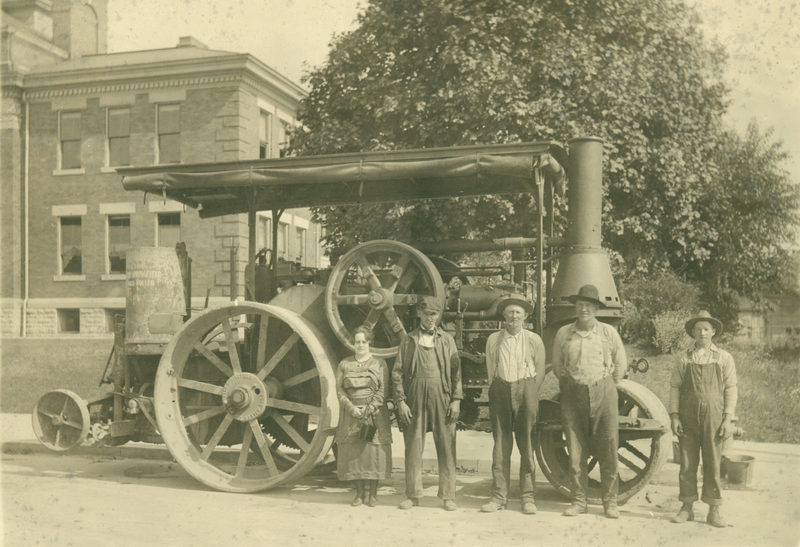 He returned to the family farm and entered the grain and produce trade and also taught school. He married Anna Kirkpatrick in 1850 and eventually relocated to Springfield in 1856. 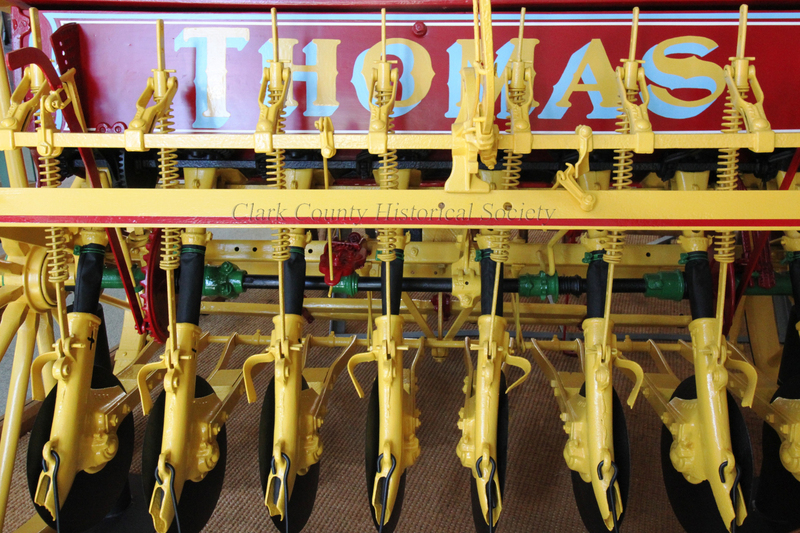 He formed a partnership with John H. Thomas (whom we mentioned in our WHERE is it Wednesday post a few weeks ago) and formed Thomas & Mast, manufacturing agricultural implements. He bought out the company in 1871 and established P.P. 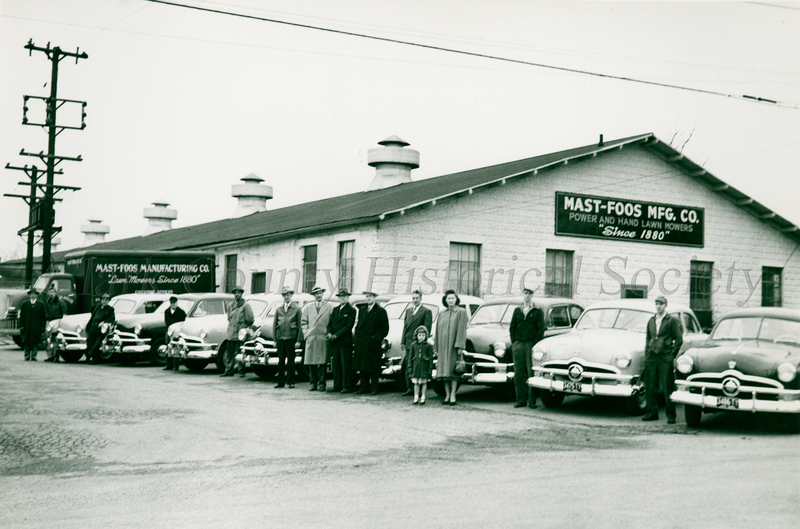 Mast and Company. 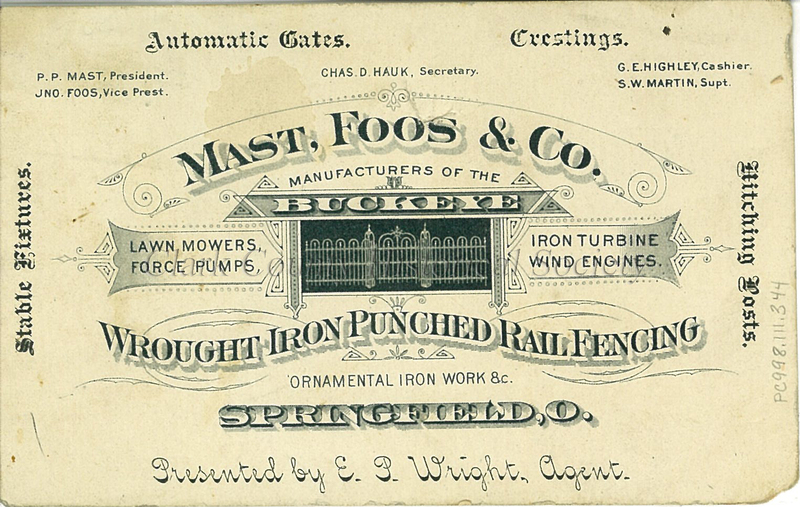 Mast founded Mast-Foos Manufacturing Company in 1876, producing wind engines, pumps, plows, and mowers (he also had the P.P. 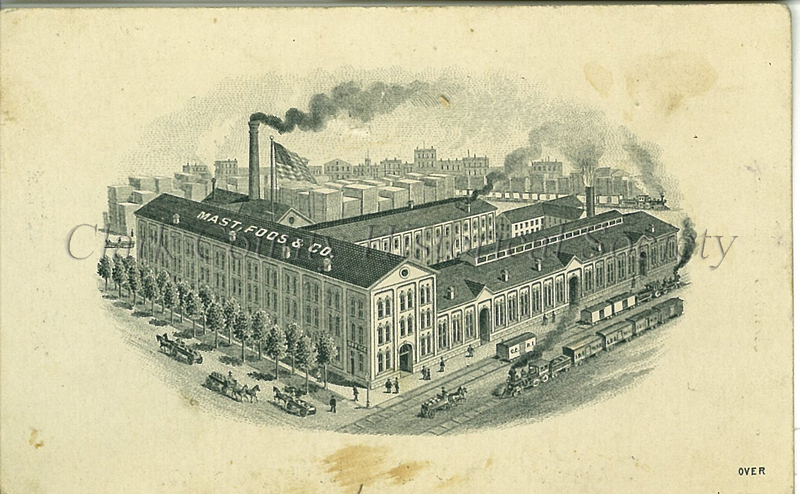 Mast Buggy Company). 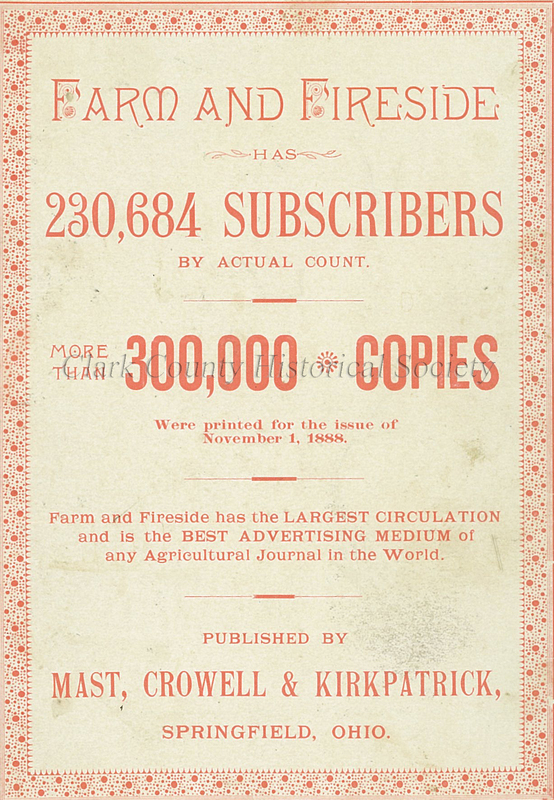 Mast envisioned a magazine that could help to promote his products and hired John S. Crowell to start the magazine and his nephew T.J. Kirkpatrick to serve as editor and thus, Farm and Fireside was launched in October 1877. In 1883, the firm known as Mast, Crowell, & Kirkpatrick acquired Woman’s Home Companion and later published American Magazine. 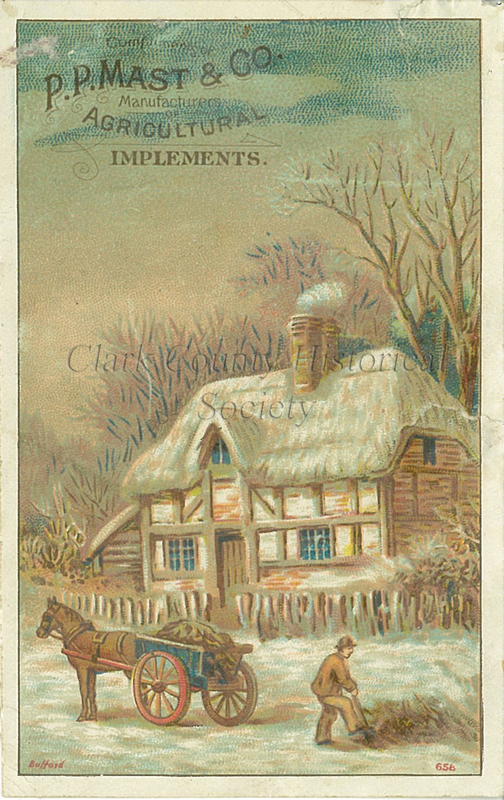 (Several years after Mast’s death the company incorporated as the Crowell Publishing Company in 1906 and in 1919 purchased Collier’s Weekly and eventually merged with P.F. Collier Publishing in 1934 to become the Crowell-Collier Publishing Company). Mast served on the Springfield City Council for 22 years, was mayor from 1895-1897, and president on the Board of Trade (later Chamber of Commerce). He was instrumental in the formation of the Clark County Historical Society (proposing the adoption of our name in August 1897). 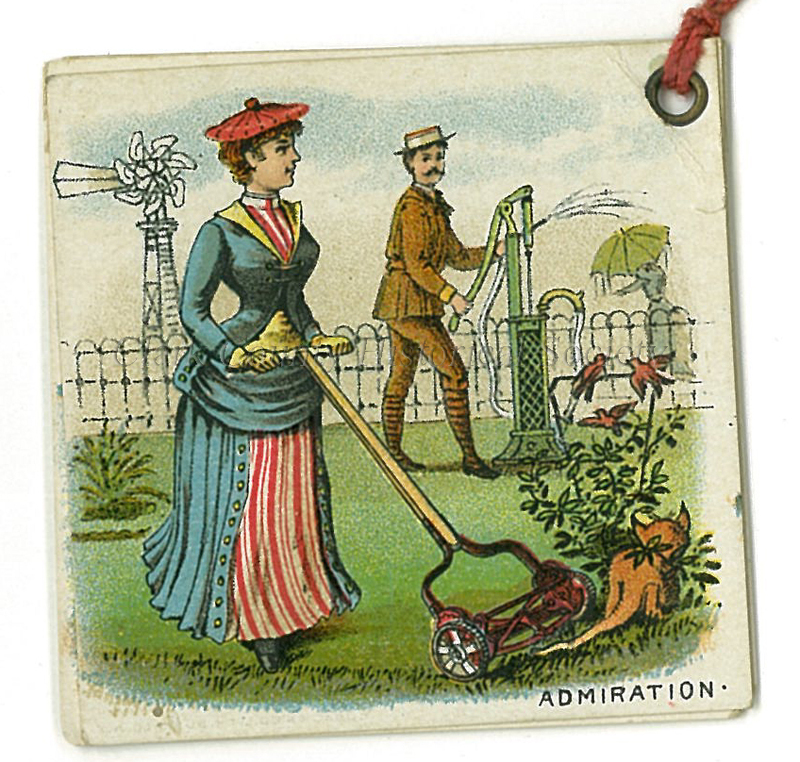 His home, life, and ventures are well represented in the historical society’s collection: trade cards, photographs, objects (Buckeye pumps, lawn mowers, a windmill), and magazines (we have nearly a full run of all the magazines published from the 1870s-1956 when Crowell-Collier closed). Many events of Mast’s life, career and his companies is recorded in the diaries of George Netts in the archives. Netts’s diaries span the years 1868-1933 and detail many major events in the history of Springfield. George Netts diary entry from October 3, 1915. On our Facebook page on Wednesday, September 10, we shared this sketch of an early Clark County home to see if anyone could guess where it was. This was a tricky one! 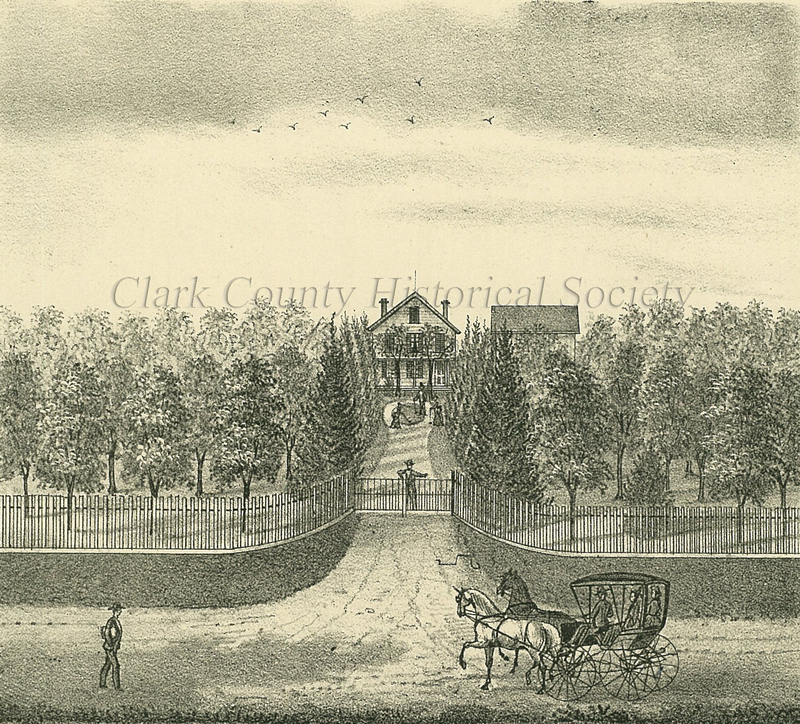 It showed a sketch of a home from the 1875 Clark County Atlas, the home of Jacob Thomas. 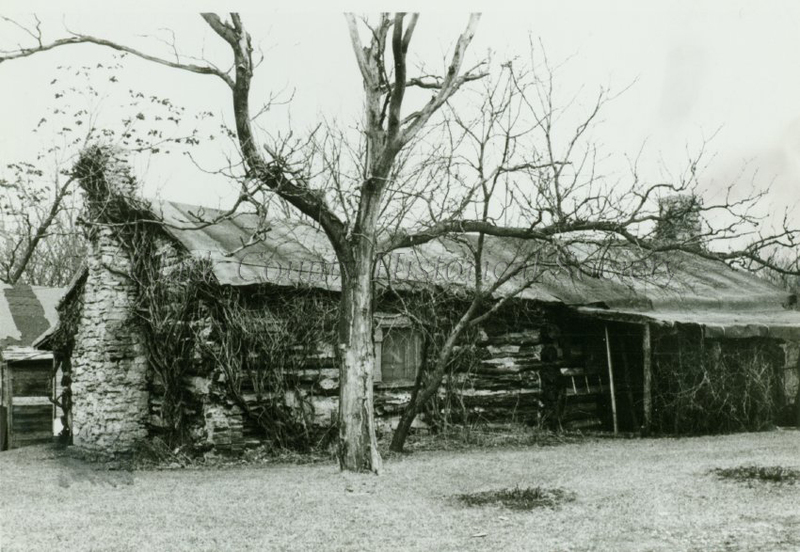 It was formerly located on the northeast corner of N. Limestone and E. McCreight at 1206 E. Limestone and it was the home of Jacob and Sophia Thomas, who came here from Maryland in 1851. Jacob Thomas and his sons owned quite a bit of land farther north on Limestone and it appears that the home pictured in the 1875 atlas was built around 1870 according to the Springfield City directories. 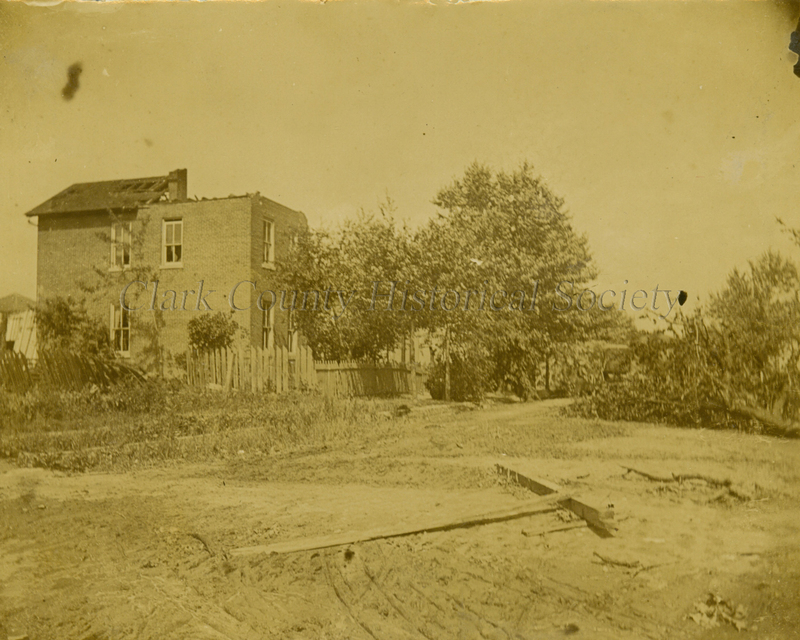 The corner where the house was built was right on the corporation line for the city of Springfield at the time, so until the late 1800s it was JUST outside the city limits. 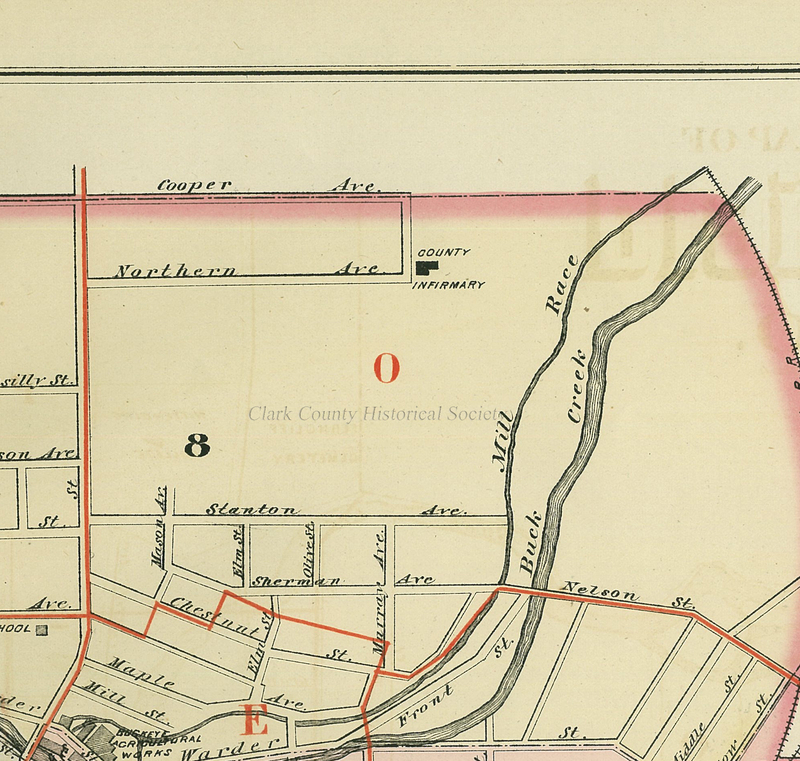 1882 Atlas showing the corner of Limestone and Cooper (later McCreight) where the home stood. The last Thomas in the home was Jacob’s son Thomas. The house was torn down around 1923 and was later home to a gas station and is now where Muffler Brothers is located on North Limestone. 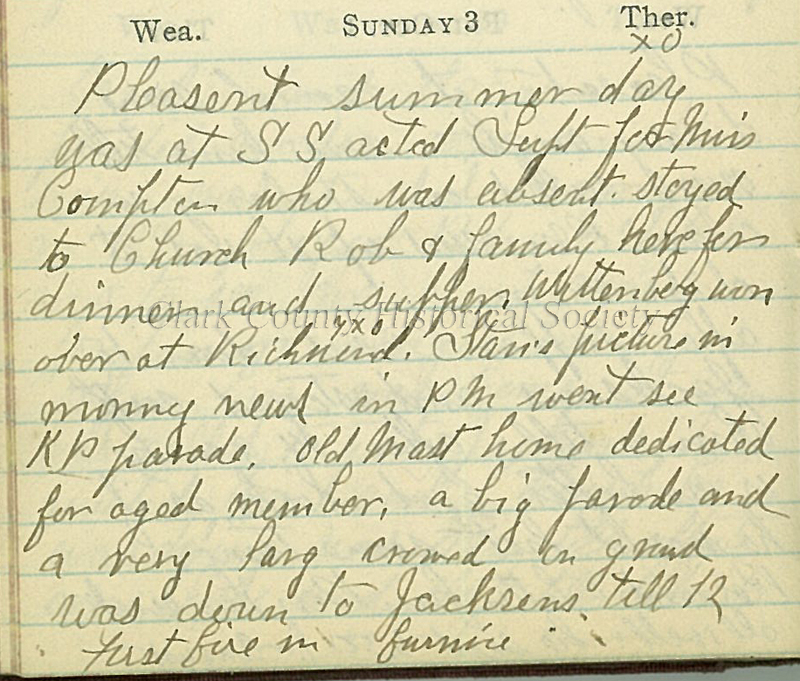 Our archives didn’t yield a lot more information on Jacob Thomas, but one of his sons, John H. (J.H.) Thomas was a very prominent Springfield citizen. 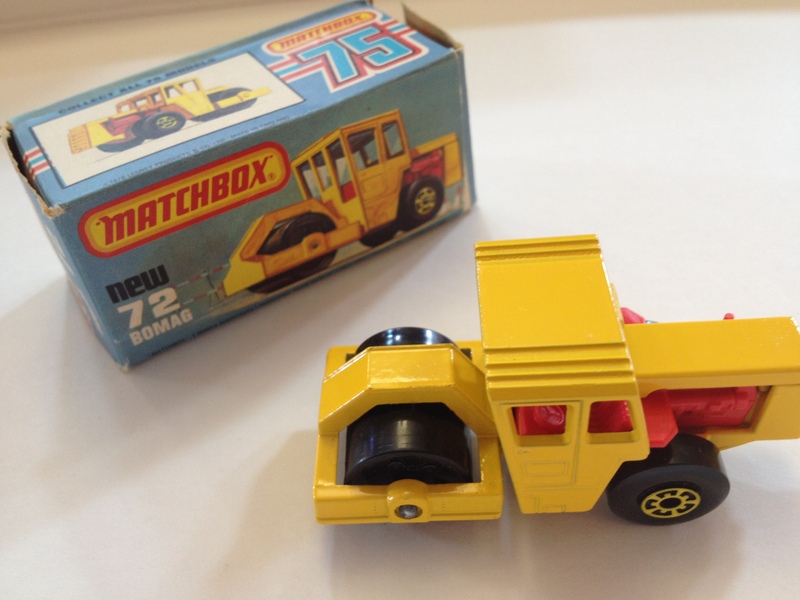 John founded the Thomas and Mast Company with industrialist P.P. 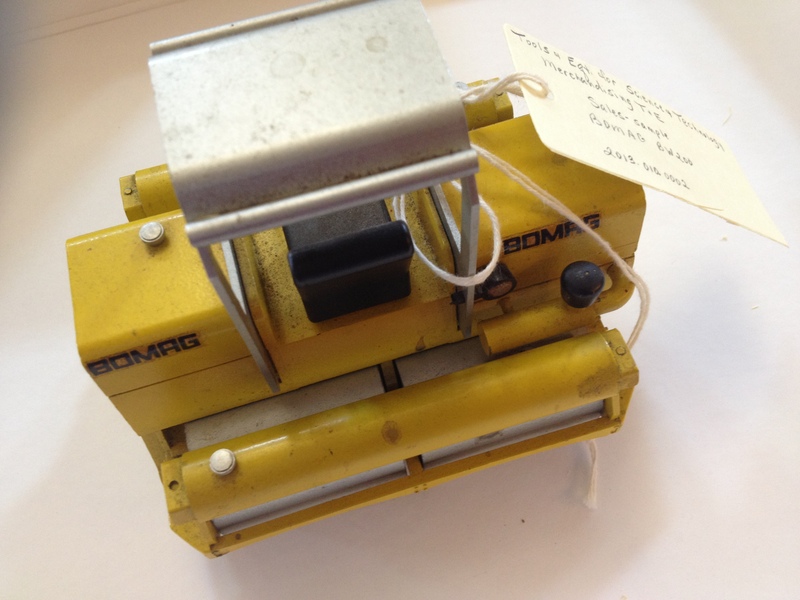 Mast in 1855 and the specialized in Buckeye grain drills, seeders, and cider mills. 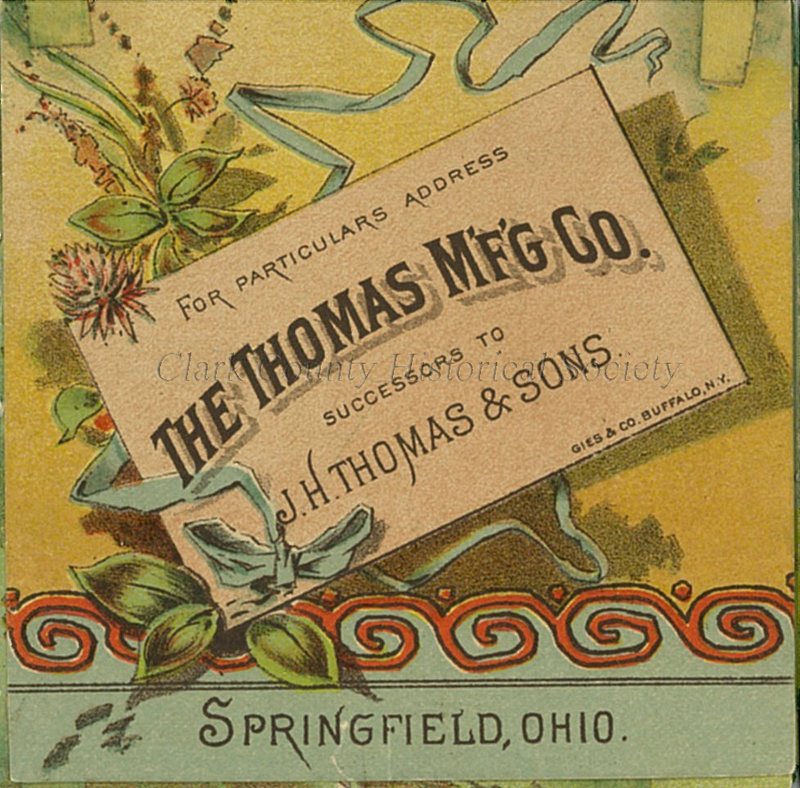 John Thomas left the company in 1872 and in 1874 he formed the Thomas Manufacturing Company with his two sons, William and Findley. 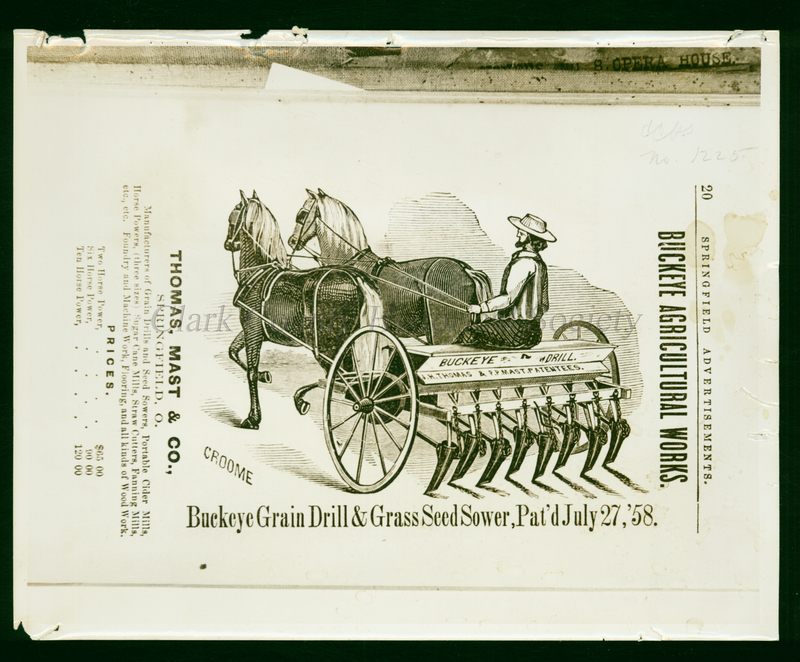 The company made a variety of products including hay rakes, steam engines, lawn mowers, pumps, disc harrows, bicycles, grain drills, and seeders. 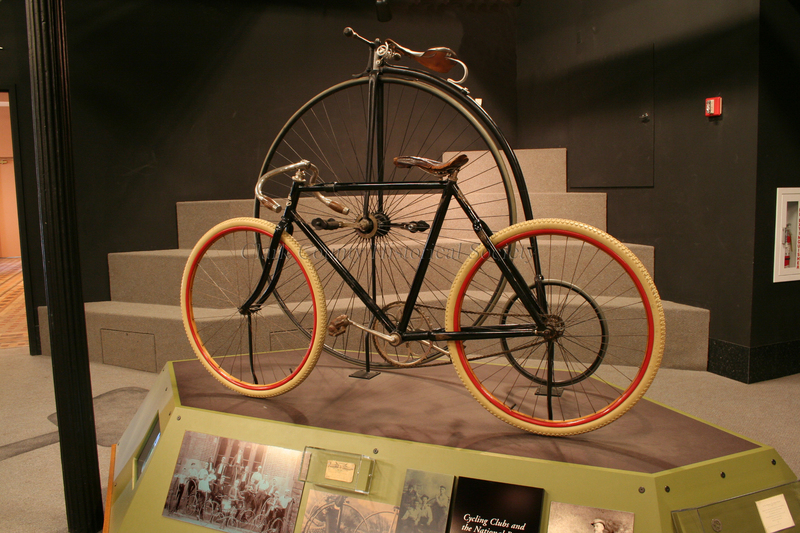 We have a grain drill and a Thomas bicycle on display in the museum along with a few products from Thomas and Mast. John Thomas was a major philanthropist in the community, serving on city council and the Snyder Park board. He and Ross Mitchell gave a large financial gift that allowed for the establishment of the Mitchell-Thomas hospital on E. Main street, which was in use from 1887-1904. Mr. Thomas has the distinct honor of having THE tallest monument at Ferncliff cemetery. 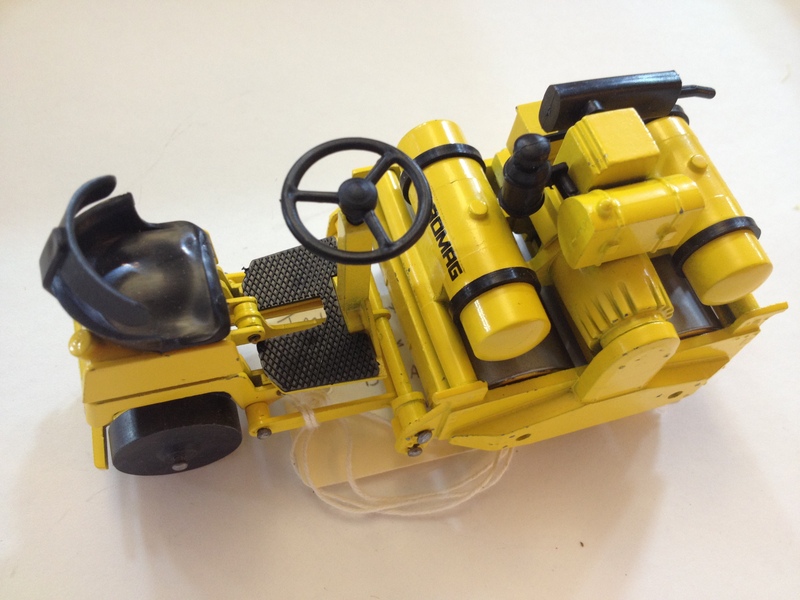 Manufacturing Category – Thomas Manufacturing Co. This week on our Facebook page we shared a photo to see if anyone could identify the location in Springfield. We had quite a few good guesses and several guesses that were correct! 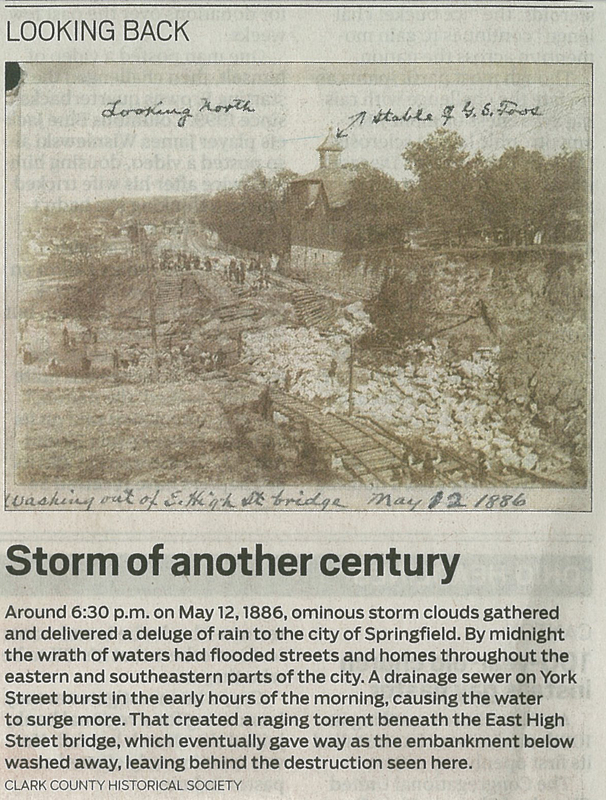 Coincidentally, the photo that we submitted to the Springfield News-Sun newspaper for Monday’s “Looking Back” photo was a photo from the same disaster file: the 1886 Flood. 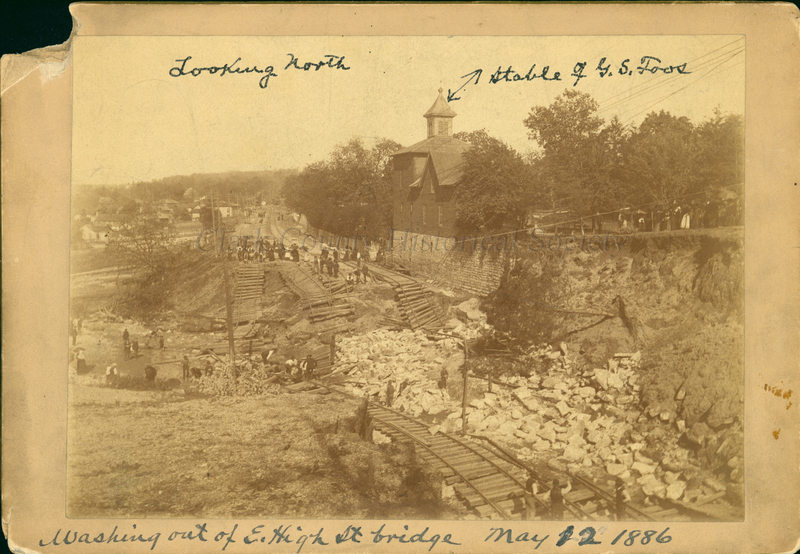 The photo we shared on Facebook showed Eastern School, located at the corner of E. High Street and Penn Street following the collapse of the E. High Street Bridge on May 12, 1886. 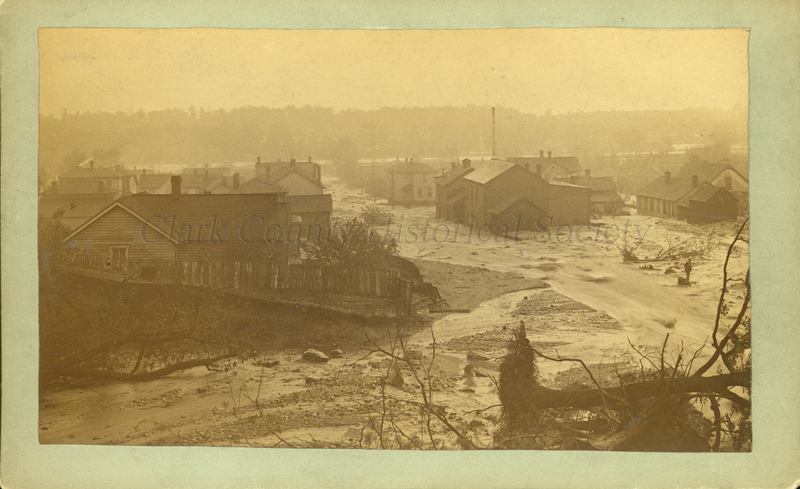 Around 6:30pm on May 12, 1886 “ominous storm clouds” gathered and delivered a deluge of rain to the city of Springfield. By midnight “the wrath of waters” had flooded streets and homes throughout the eastern and southeastern parts of the city. 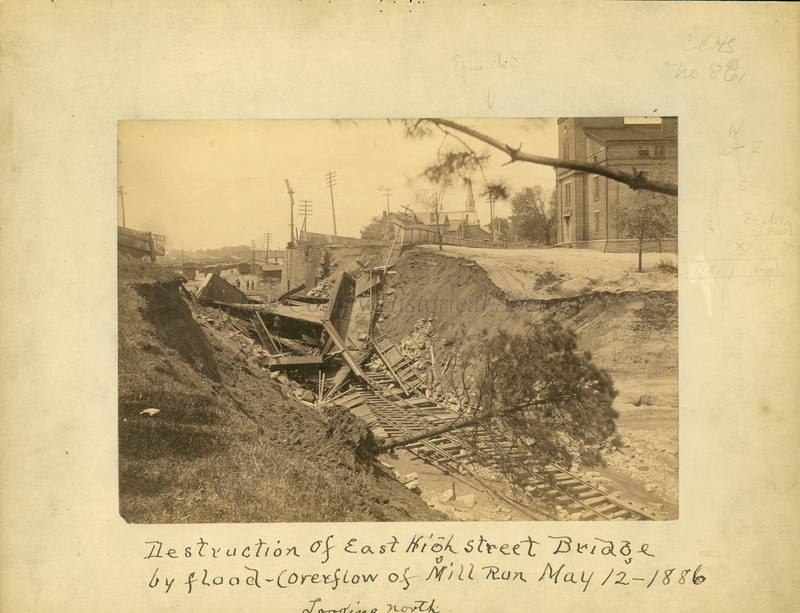 A drainage sewer on York Street burst in the early hours of the morning, causing the water to surge more, creating a raging torrent beneath the E. High Street bridge, which eventually gave way as the embankment below washed away, leaving behind the destruction seen here. 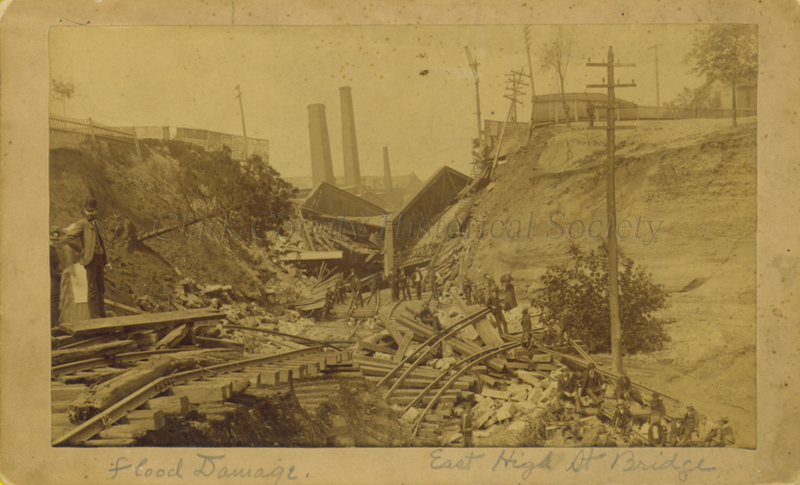 The eastern part of the Eastern School yard closest to the railroad had washed away and it was feared that continued use of the building would be unsafe. There were a few emergency meetings with the School Board and consultation with local architects F.H. 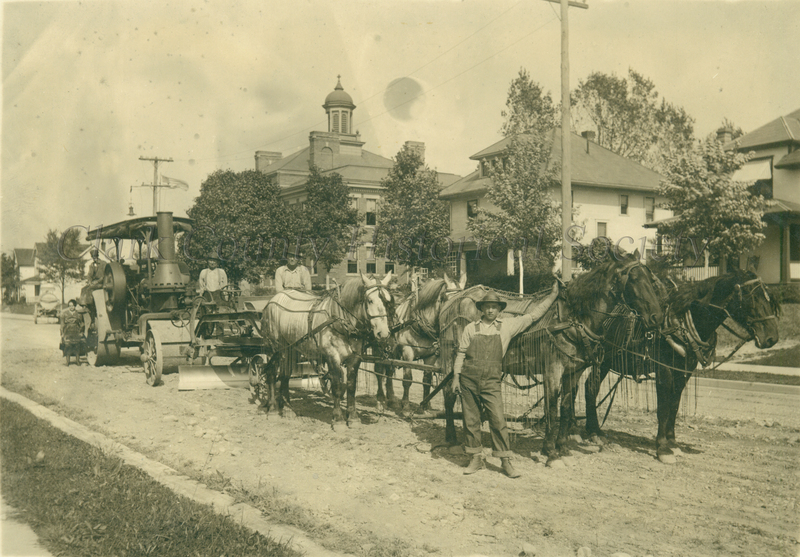 Penfield and Charles A. Cregar (he designed the City Hall/Marketplace/Heritage Center in 1890). Although the architects assured the board that the building was sound, on May 15, 1888 the Board voted to “forever abandon the building” and distribute the pupils throughout the city to other schools. 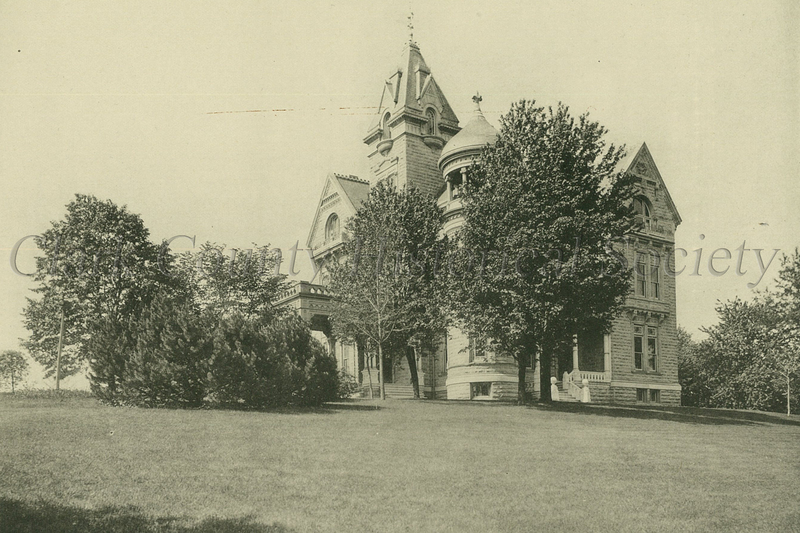 A new Eastern School was built in 1887 farther up on the south side of E. High near Freeman Street (across from current Catholic Central), it was later known as McKinley School. It is not clear exactly when the original Eastern School building was torn down, but it sat abandoned for a number of years. 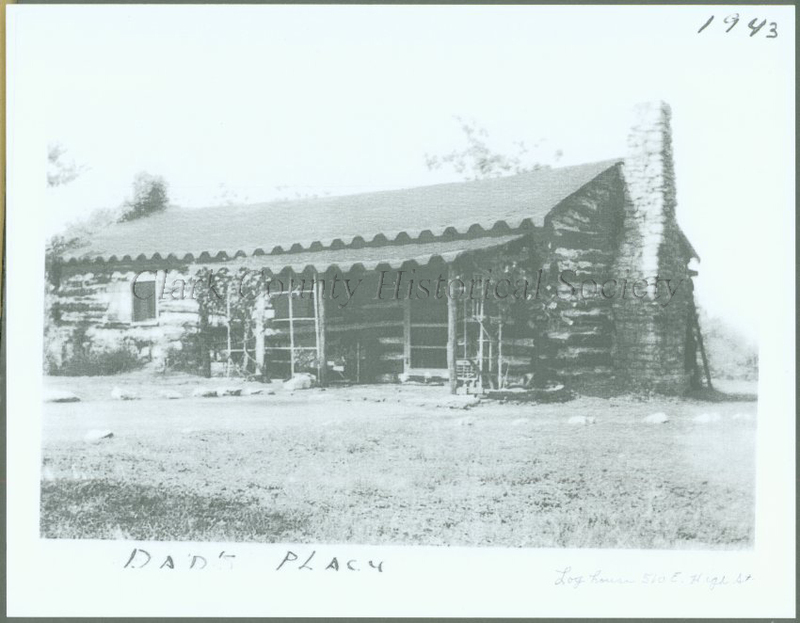 Later, the Centennial Cabin, a replica of James Demint’s cabin, was moved to that site. 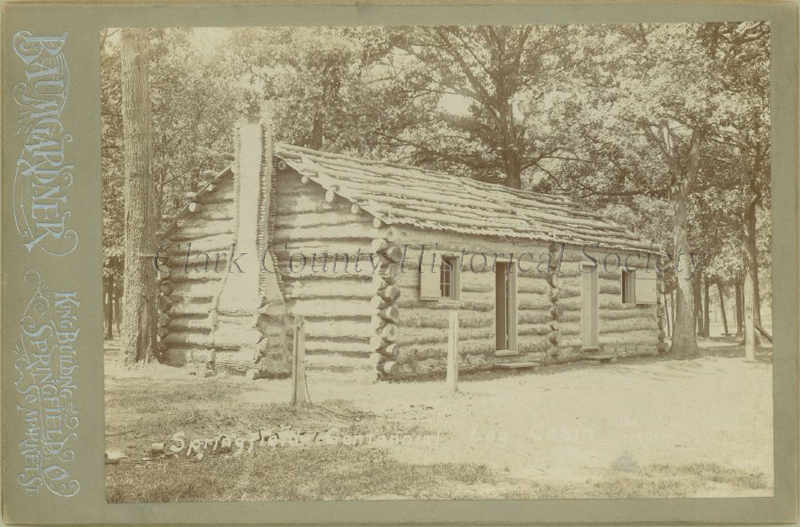 The Centennial Cabin was built for the 1901 centennial of the city of Springfield and was originally located at the county fairgrounds on Yellow Springs Street. During the centennial celebrations the cabin was open as a museum run by the Daughters of the American Revolution. 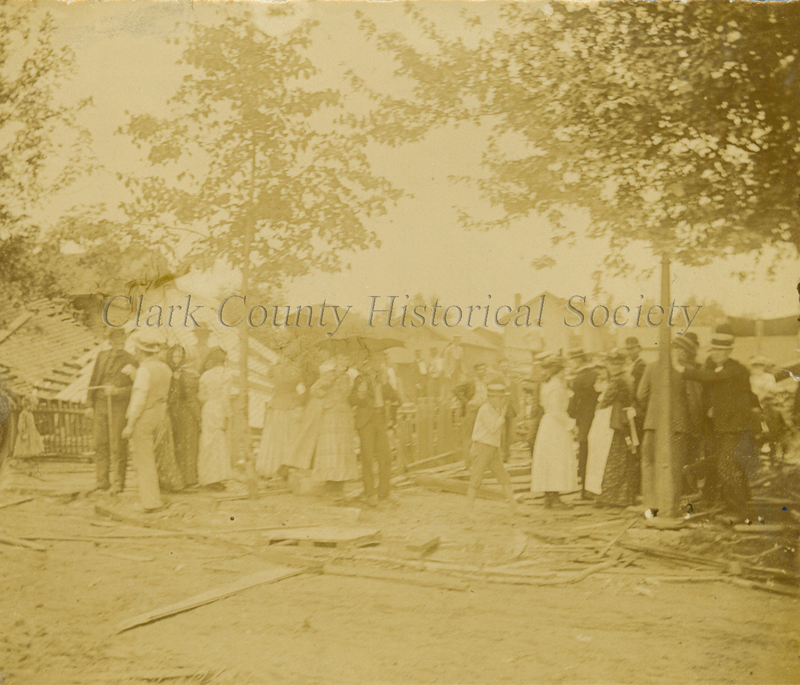 The following pictures show the site of the bridge collapse, more photos of the May 1886 flood from our Disaster Collection in the archives and the Centennial Cabin in 1901, 1943, and 1975. We really had a lot of great guesses with this one! 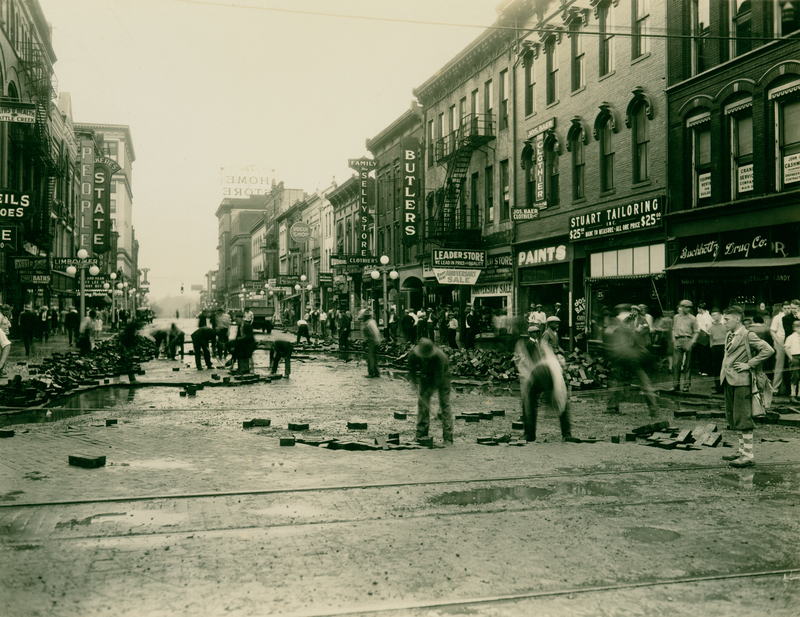 Most people noticed that the photo showed a paving crew and there was a lot of speculation as to where in Springfield this could be. 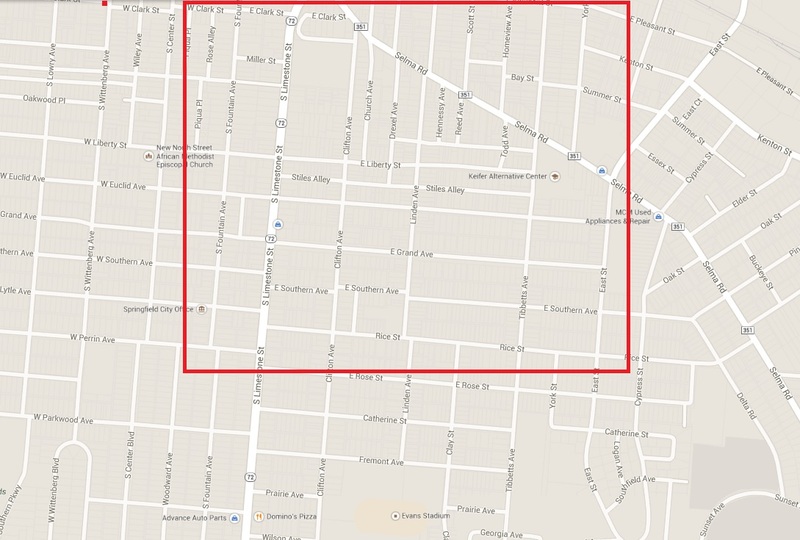 Guesses included Fountain Avenue, Limestone Street, High Street, and Lagonda Avenue. 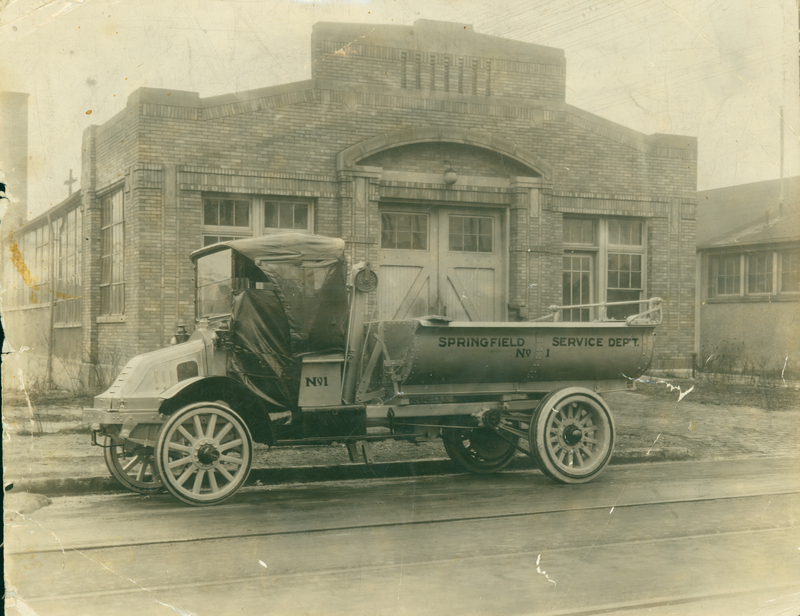 There were several people who recognized the school in the background (which was the big giveaway) as Elmwood School, which was located at 280 S. Clairmont Avenue. When the photo was donated to us in 2012, the donor did not provide any identifying information, so we did our own detective work to discover the location. We started off in the wrong direction with a suggestion that this was Sunset Avenue around 1932. 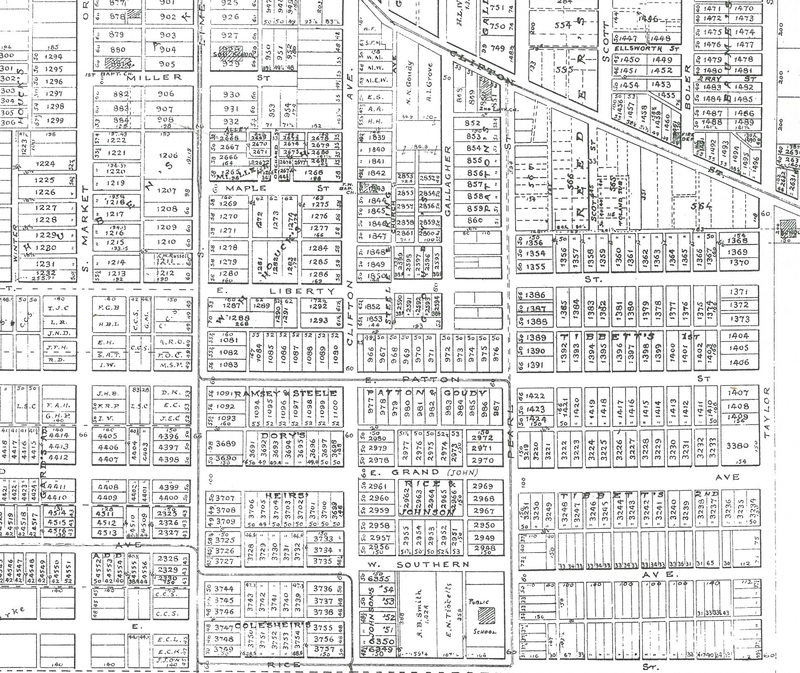 We did a little bit of scouting back in our archives, through the city directories, and on Sunset Avenue in person and found some promising matches on houses and learned that architect Robert Gotwald had built Trinity Evangelical Lutheran on Sunset in 1913. Although the building in the background didn’t look very churchlike, it DID look like a Gotwald building to us. 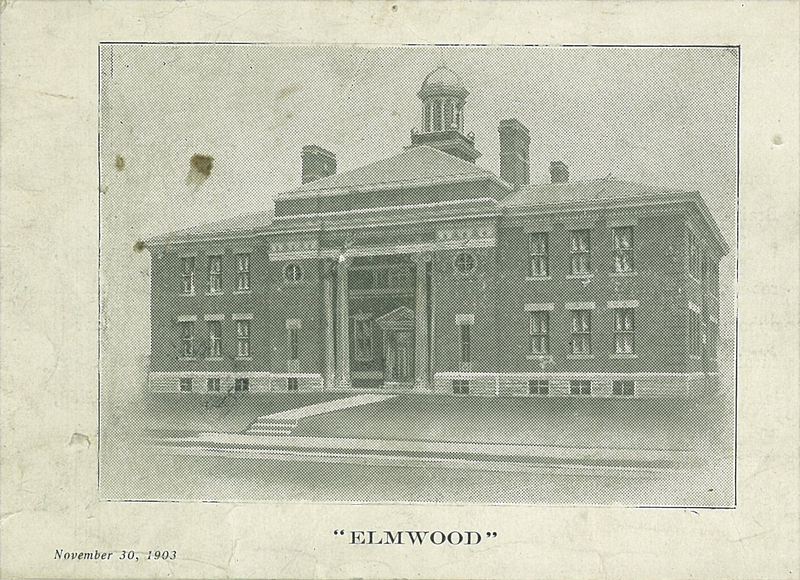 Luckily, one of our volunteers thought to flip through the Harry Laybourne “Springfield, Ohio Revisited” photo book and was able to match the building as Elmwood School. We did a bit more research and found the dedication program and learned that Robert Gotwald had also been the architect for Elmwood School in 1903. We also wanted to share with you some more interesting finds from our collections: a 1931 map of Springfield showing the paved streets highlighted in yellow, Bomag road roller models donated last year, Kelly Springfield and Buffalo Springfield road roller photos from catalogs in the archives, and repair on an unpaved N. Fountain following the February 1929 flood. Last week we shared this photo for WHERE is it Wednesday to see if anybody could recognize the Springfield location. There were quite a few good guesses: High Street, Lagonda Avenue, North Street, Fountain Avenue, to name a few. 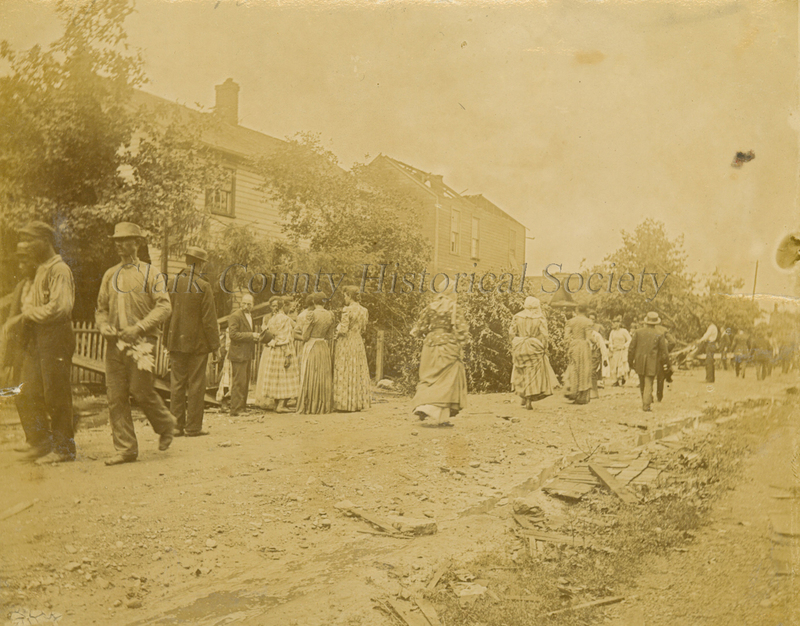 Many noticed that the scene showed heavy damage and rightly guessed that this was a scene after a tornado. 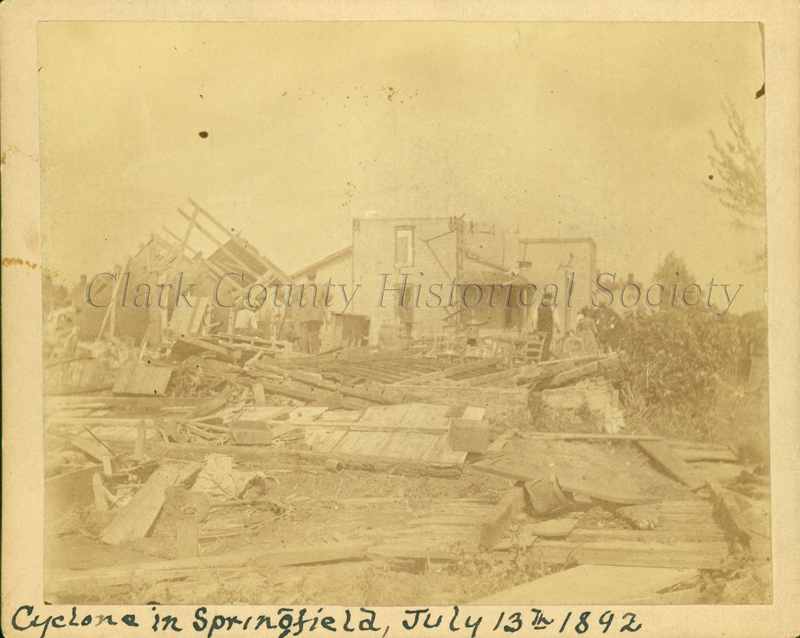 Some even guessed this was the aftermath of an 1888 tornado that hit the Springfield area. Everyone was on the right track! 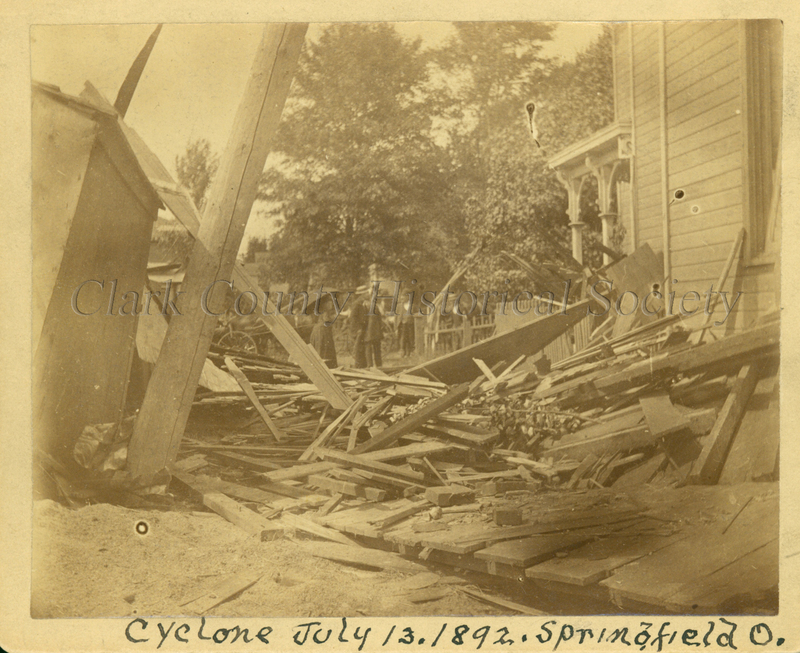 This particular photo shows the damage on E. Grand Avenue after a cyclone ripped through the area at around 11:00am on July 13, 1892. 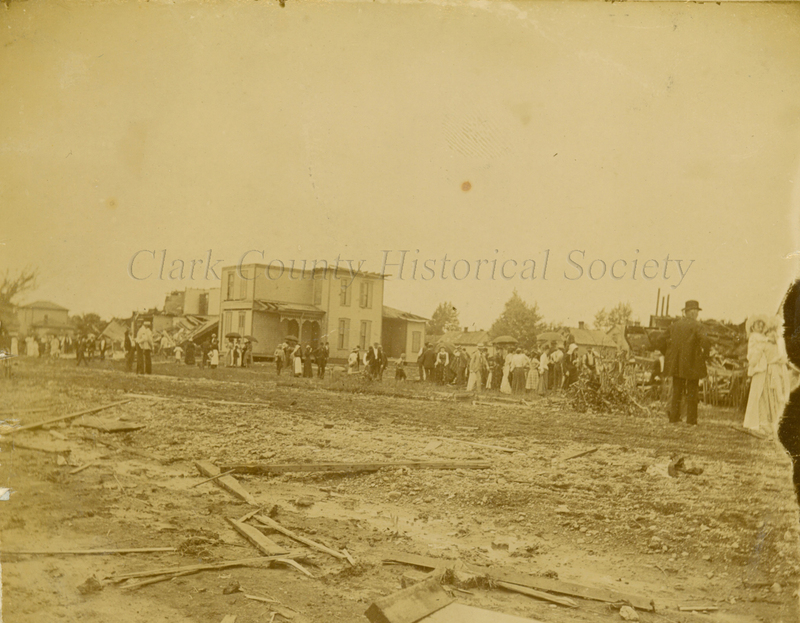 Dozens were injured and over 100 homes were demolished or heavily damaged mostly in the area bounded by Center Street, Clark Street, East Street, and Southern Avenue. 1894 Atlas section showing the area affected by the 1892 cyclone. 2014 Google Map highlighting the area affected by the 1892 cyclone. 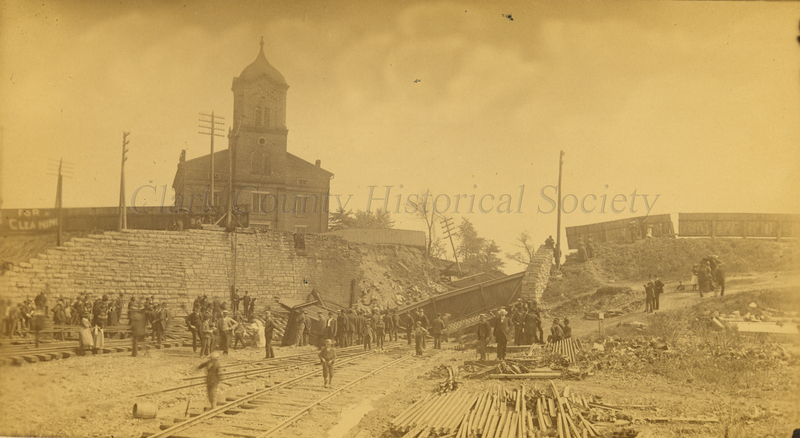 The original photo comes from our Disaster Photo Collection, which was recently scanned by a volunteer. The very first folder in the collection was of the cyclone aftermath and when we realized that the anniversary date was approaching, we decided to look up the newspaper coverage from that time and share the pictures and story. 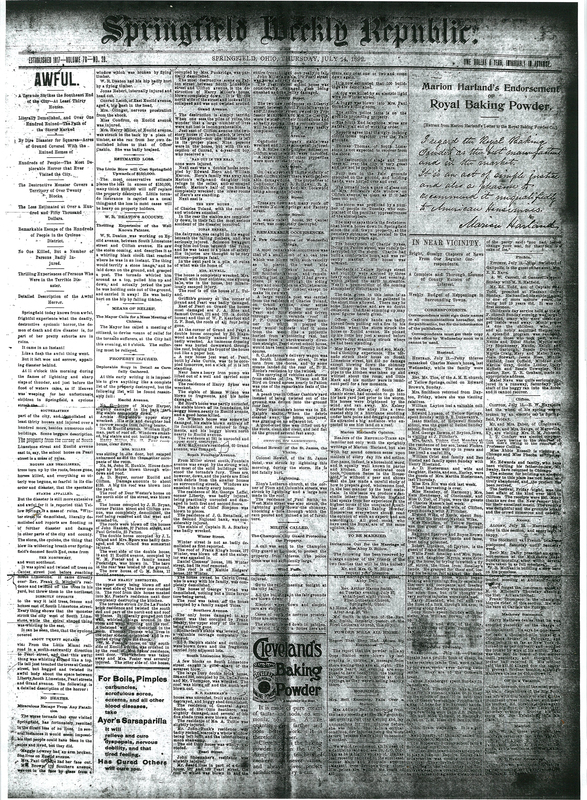 We turned to the microfilmed copy of the Springfield Weekly Republic and found lots of great details including the names of all those who were injured (and detailing their injuries), addresses and details about damaged homes, information about the relief fund (who headed it and who contributed what), and the exact amounts claimed by residents affected. The relief fund, which raised nearly $9,000 to help the affected residents, was headed by a committee that included Mayor Burnett, Asa Bushnell, P.P. Mast, and O.S. Kelly. Total damages across the city topped $20,000. 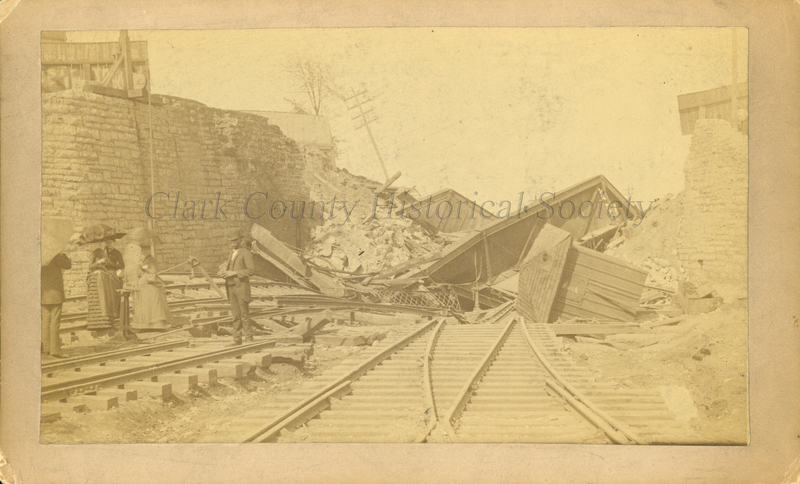 For more information on the cyclone (we printed all the coverage from the days following to add to the archives) and for coverage on other local disasters, check out our Disaster Collection, which includes a detailed list of floods, fires, blizzards, and more from Clark County’s history. 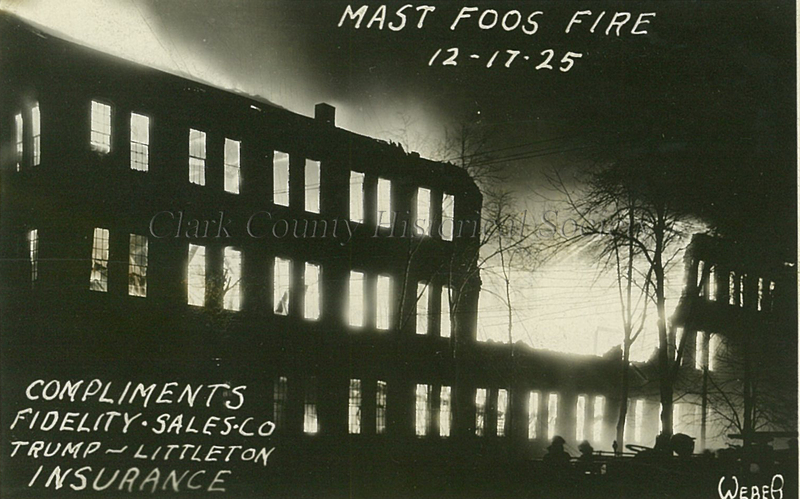 Clark County Historical Society Archives, Small Collections Category, Disasters. Clark County Historical Society Library, Springfield Weekly Republic, Microfilm reel August 8, 1891-July 28, 1892. (Coverage July 14-July 28, 1892). Clark County Historical Society Library, 1894 Clark County, Ohio Atlas.